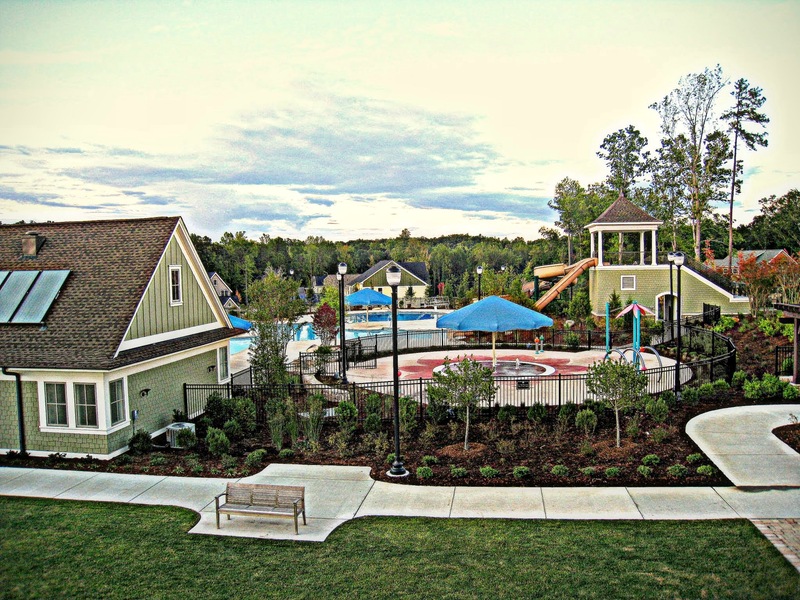 Bedford at Falls River is a 607 acre master planned development based on traditional neighborhood design. It was begun in the 2001-2002 time frame, and the trees and other plantings have matured to make a drive down its streets feel like traveling through the established parts of Inside-the-Beltline Raleigh. There were 1750 units planned. Although Bedford is not further broken into specific neighborhoods, there are areas defined by their housing type, such as areas with townhouses , or detached dwellings of a particular size range, perhaps arranged around a commons. A diverse team of both local and national builders constructed the homes. Wakefield Development Company was the original developer of Bedford. It was completed by JPM South Development, its successor. Wakefield’s awards information shows Bedford has received multiple awards from home builders’ associations. It was listed by Where to Retire Magazine in its July-August, 2005 issue as being among the top 100 master planned communities in America. Over 30% of the area is preserved as common area in pocket parks and larger preserves or gathering areas. There is a Recreation Center with a 3500 square foot club house, swimming, tennis, basketball, volleyball, and a playground. See more below. The central commons area has expansive open areas with a 60′ high clock tower in the center. Surrounding the central town commons are homes, the Recreation Center, and the Shoppes at Bedford. See more below. The Shoppes at Bedford, including three restaurants, a day care facility, and a fitness center are interior to the community, and are easily walkable for many residences. More below. A 27 mile trail beginning at Falls Dam follows the Neuse River. There are two entrances with parking in Bedford. More Below. WakeMed North Hospital is nearby , close to Falls and Durant Roads. Groceries and other shops are nearby, one being on Falls River Ave. near Durant Road. See the spatial map lifestyle search for groceries. The Wake Co. and Raleigh school systems are consolidated. Because this is a high growth area, understanding school assignments is sometimes not that straight forward. Please see the Schools page of this website for more information. You can review the statistics and performance of these schools at ncreportcards.org . Abbotts Creek Elementary was recently opened and is not included in the data. Elementary- Abbotts Creek. This school is located on 9900 Durant Road and follows a traditional school year calendar. Middle- Wakefield Middle. Traditional School Calendar. Located on 2300 Wakefield Pines Drive. High- Wakefield High. Traditional School Calendar. Located on 2200 Wakefield Pines Drive. The maps that show the areas for the schools are not that easy to read, and when you focus on a particular home, you should enter the address on the assignment page of the Wake County Public Schools website and verify the base school and its availability. Please make sure to look at the information regarding capped schools and other issues that may be of interest. Below is a Google Map. You can enlarge it and zoom on anything of interest as you look through the site. Falls of the Neuse Road is a major artery leading north from Raleigh to Wake Forest. Just before reaching the Neuse River, a right turn (east) on to Dunn Road brings you to a rotary with the Bedford entry feature shown above. The second exit is the continuation of Dunn Road. The third exit is Falls River Avenue. This is the main road circling through Bedford at Falls River. Eventually it recrosses Dunn Road farther east and then runs out of Bedford into the remainder of the Falls River area, finally exiting on to Durant Road. Bedford covers a good deal of area with many homes. Following Falls River Avenue is a good way to get started seeing it. Take a look at the map and you can see that Falls River Ave, makes a loop which begins and ends on Dunn Road. It serves the homes along the Bedford perimeter as well as those inside the loop it makes. Below are some of the areas and homes along the way. We start by heading north on Falls River Ave. after leaving the Dunn Rd. traffic circle. Hopeton Avenue is the first right off Falls River Avenue. The road is divided by commons areas with somewhat densely placed detached homes lining the streets. The photo above is typical. Following Hopeton will lead to a circle where it intersects with Evergreen Spring Place. From there it continues on to where it ends at Bedfordtown Dr.
Evergreen Spring is built around commons similar to Hopeton. It continues to Cloud Cover Lane, just beyond which is the Recreation Center and Club House. The traffic circle where these two streets meet is the approximate center of what appears to be about 200 lots and homes of similar densities. Many of the homes are served by rear alleys. Jellystone Park is just beyond Hopeton on Falls River Ave. on the edge of Hopeton-Evergreen. Karns Place is part of Hopeton-Evergreen area. Falls River Avenue continues past what I am calling the Hopeton-Evergreen Spring area and becomes a traffic circle at its intersection with Bedfordtown Road to the right, and Wide River Drive to the left. Bailey Park, shown below, is to the left of Falls River Ave. just before the circle. Bailey Park. This is representative of Bedford signage, which is restrained in scale, but effective and pleasing. Bedford-Bailey Park, one of several playgrounds located throughout Bedford. Continuing on Falls River Ave., in a more easterly direction, you pass Cardington Lane and Lake Adventure, and reach Saint Paul’s Square, a road divided by the Town Commons . In 2015, there were 3 sales of attached homes on St. Paul’s Square, not necessarily of the townhouses shown. These ranged in size from 1,878 to 2,243 Sq. Ft. with 3 bedrooms and 2 1/2 baths. They sold from $256,500. to 272,000. The Commons From Clock Tower Looking South Toward Recreation Center on Bedfordtown Dr. The North View Back Toward Falls River Ave. is Similar. This central commons area is a spectacular feature that would be a significant focal point for most towns. The clock tower , shown earlier, is located in the middle of the commons in a traffic circle where Saint Pauls Square (the divided road shown) and Cardington Lane cross. At the Falls River Avenue end of the central park is The Shoppes at Bedford commercial area . A Triangle Business Journal Story dated 7/14/14 indicated that the center was 29,074 square feet, opened in 2008, and was 96% occupied at the time of the story. Other places to eat or have coffee are Cafe Buongiorno’s and Sushi Lulu. There are financial and real estate services. Dog City Spa takes care of the pets. You can work out at Any Time Fitness. Bedford Bistro and Bar, Opposite Side of Shoppes at Bedford from Town Center Commons. Just beyond and across Falls River Ave. from the town center area is Snowy Meadow. N. End of Lake from Falls River Ave. at Chandler Way. Chandler Circles Lake and Rejoins Falls River Ave. to East. Neuse River Trail at Northeast Edge of Bedford Along Falls of Neuse Ave. The Neuse River Trail is a 27.5 mile path that begins at the Falls Lake Dam, just west of Bedford. Both 3324 Falls River Avenue, shown, and 10888 Bedfordtown Drive have access to the trail with parking. The Neuse River Greenway Trail offers scenic views of the Neuse River, winding boardwalk areas through wetlands, historical sights, interpretive signs, and agricultural fields. In addition to being part of the City’s Capital Area Greenway System, it is a segment of the Mountains-to-Sea Trail, which is a long distance trail that runs across North Carolina from the Great Smoky Mountains to the Outer Banks. One thing that needs to be mentioned is the large power lines seen here. These lines run through the east side of Bedford at Falls River. They are screened reasonably well in some places and are more visible in others. Some people don’t care about them, and others do. I am just making you aware of them. The houses below, for example face the power lines across Falls River Ave., but are to an extent screened from them even in early spring, by a vegetative buffer. The entrance to this area from Falls River Ave. is Grand Journey Avenue. It is a divided road and widens around a park area. Around the park are homes on larger lots. Other streets in the area are Storybrook Lane, Enchanted Hollow Way, Canoe Brook Parkway, and Rain Forrest Way. Past Grand Journey, Falls River Ave. intersects with Bedfortown Dr. in a traffic circle, and continues until it enters the Falls River subdivision, eventually coming to an end on Durant Road. Driving back into Bedford from Falls River leads to Bedfordtown Drive at the traffic circle. Going 3/4 around taking Bedfordtown to the northeast , it is about 3 blocks to the Recreation Center on the left, and the central town commons and clock tower on the right. The Bedford at Falls River Club House and Recreation Center is located at the south end of St. Paul’s Square on Bedfordtown Drive. The interior street that crosses the town center commons at the clock tower is Cardington Lane. Pottersville Park is about 2 blocks east of the clock tower. Pottersville Park on Cardington Lane Just East of Clock Tower. Bedford-Lake Adventure from Cardington Lane. Houses Shown are on Falls River Ave. Clock Tower From About 1 Block to its East on Cardington Lane. This information comes from the Triangle Area Multiple Listing Service (TMLS). There were 102 sales in Bedford at Falls River. There were 72 detached dwellings sold ranging from $208,000 to $805,000, with the average being $434,984, and the median being $418,500. The prices were distributed as follows: $200s-8 homes sold; $300s-17 homes sold; $400s-26 homes sold; $500s-18 homes sold; $600s-2 homes sold; $700s-none; $800s-1 home sold. 61 of the 72 detached home sales were in the $300,000-$599,999 range-85%. The average sales price/ list price was $434,984/ $442,096-98%. The median sales price/ list price was $418,500/ $424,950-98%. The days on the market ranged from 0 to 242. Average days on the market were 43, with the median being 20. This was a good market for sellers. It is reflected in low days on the market and high percentages of listing price realized. Buyers who have done their homework and are prepared to move quickly will be rewarded in a market like this. 30 attached dwellings were sold in Bedford in 2015, ranging in price from $156,500, to $294,000. The average price was $192,258, and the median was $175,000. The days on the market ranged from 0 to 213. Average days on the market were 24, with the median being 12.